Exactly what is a "RoadTrip Rendezvous?" Now that we've had our first one -- it happened the first week of May, 2005 -- we've come up with a definition. Participants take roadtrips that share one element: their itineraries converge at a set location in North America for a day or two. Participants meet, share a meal or two, and do something interesting together. The "something" might be anything from a music festival to a duck race -- North America is a big, fabulously diverse continent. 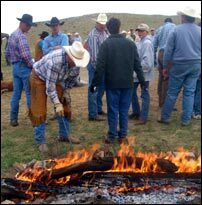 In the case of the first RoadTrip Rendezvous, the "something" was a cattle branding on a ranch in southern Wyoming. Expert solo roadtrippper Geneviève (Gen) Lauzière hit the road first, when she left her home near Granby, Quebec, Canada, on Wednesday, May 4th, and headed west on her way to Ft. Laramie, Wyoming. The next day, Bob Schaller, Megan Edwards, and Mark Sedenquist left Las Vegas, headed north up Interstate 15, with the same destination: the ranching area between the small Wyoming towns of Guersney and Torrington. By midday on Friday, two other couples were on the road: Kathleen McMahon & Gerald Thurman of Tempe, Arizona, and Charlie and Betty Carmona of Los Angeles, California. 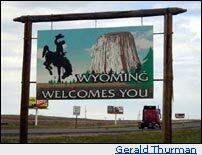 Gen covered the most ground, having driven nearly 1860 miles (2991 kilometers) by the time she reached Torrington, Wyoming. It was an amazing pace for a solo driver, but she reported that she still had time to sightsee on the way. Mark, Megan, & Bob were unexpectedly delayed when Mark drove their SUV into a treacherous ditch while stopping to check on the effects of the record spring rainfall at "Little Jamaica," a spring just north of Littlefield, Arizona. After getting a much-appreciated tug from a local rancher, the trio headed past the spectacular San Rafael Swell in Utah and on up to Torrington. 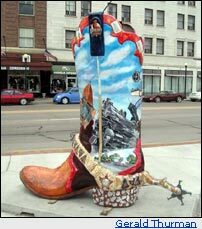 Kathleen and Gerald took time to explore the state capitol building in Cheyenne, Wyoming, savor a local brew at Snake River Pub & Grill, and admire the "boots" public art project.